Maxine O. Jacobson was born on December 14, 1939 in Kamrar, Iowa to Oliver and Lois (Munson) Mechaelsen. She married Loren Jacobson on May 28, 1960 at the Presbyterian Church of Kamrar. He died April 14, 1990. Maxine lived all of her life in the Jewell and Story City area. After Loren’s death, Maxine moved to Story City and worked as a receptionist for Wolf Chiropractic Center. She was a member of St. Cecilia Catholic Church and her church was very important to her. She enjoyed attending Iowa State Volleyball games with Sterling Wicks and getting together with her family, especially the grandchildren and great grandchildren. 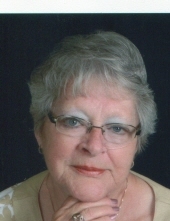 Maxine passed away November 22, 2018 at Mary Greeley Medical Center in Ames at the age of 78. Left to cherish her memory are her two daughters, Lois (R.J.) Vidimos of Ames and Susan(Paul) Johnson of rural Ellsworth; four grandchildren, Rob and Lauren Vidimos and Taylor (Angela) and Luke (Kayla) Johnson; two great grandchildren, Atlas and Caroline and her sister, Lila (Phil) Berglund of Dayton, Iowa. Maxine was preceded in death by her parents; her husband; and her brother, Lowell Mechaelsen. In lieu of flowers, memorials may be made to Mary Greeley Medical Center Oncology center or St. Cecilia Catholic Church school tuition assistance program. To send flowers or a remembrance gift to the family of Maxine O Jacobson, please visit our Tribute Store. "Email Address" would like to share the life celebration of Maxine O Jacobson. Click on the "link" to go to share a favorite memory or leave a condolence message for the family.